NEW ORLEANS – Tulane has some memorable surnames on its roster: Steven Broccoli, Kenny Welcome, Corey Redwine, Jordan Sullen, Fudge Van Hooser, and Nick Montana (son of Joe). The coolest name, though, is Marley. 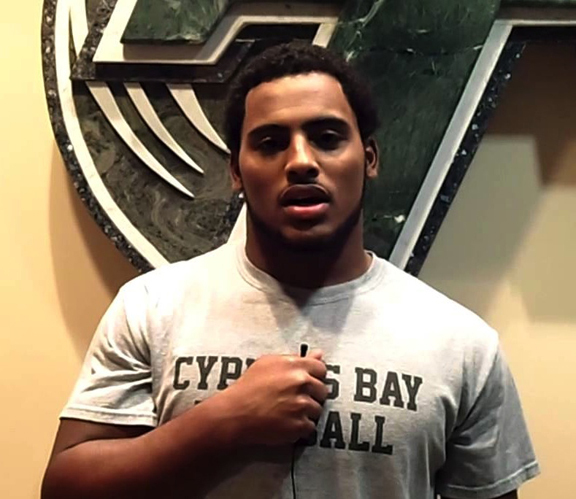 Nico Marley, freshman linebacker, is the grandson of one of the greatest musicians who ever lived. Tulane beat Tulsa on Saturday to win its sixth game – more than in any one season since 2002. One of the highlights was Marley coming out of nowhere to make a soaring sideline tackle that had both home and visiting fans oohing. Marley is third on the team in tackles even though he wasn’t supposed to play as a freshman. “Flying around and getting to the ball,” is how Marley describes his style, adding that his father, Rohan, who played for Miami in the early ’90s, had a similar flair. The Missile isn’t sure where the football gene came from; his grandfather loved soccer, but there wasn’t much gridiron talk in Jamaica. The music gene didn’t get passed down; Nico doesn’t play an instrument. “Wish I knew how,” he says. He definitely knows how to play linebacker: the freshman is another recruiting trail victory for Johnson, the same evaluator who brought Marshall Faulk to San Diego State as a running back and found lightly regarded Ed Reed in St. Rose, La., was the only FBS coach to offer Marley a full ride. Marley is ­undersized at 5-foot-8 and it was hard to see the advantages of bringing him in until he showed up on campus and started laying people out. The playing style reflects the coach, who is loud and effusive. During Saturday’s win here, which he would call “magnificent,” Johnson bolted nearly 15 yards outside the coach’s box until a referee gave him a sharp look and sent him back. Even a normal conversation with Johnson makes small talk feel like a pep talk. How upbeat? Johnson said winning the team’s sixth game of the season was better than winning the Super Bowl as an assistant for the Saints. Johnson was so charged about getting the job with the Green Wave two years ago that he drove from Saints’ offices to Tulane’s campus after work every night to focus on recruiting and staffing. He says two and a half hours of sleep was a good night for him. Unsurprisingly, Johnson doesn’t listen to much Bob Marley. “I’m a rhythm and blues guy,” he says. This 6-2 start – only a decade after Tulane nearly gave up its Division I status – has revved up the campus enough that school president Scott Cowen has dyed his hair green and blue. But it’s something more sobering that has made perhaps the biggest difference for the team. Devon Walker, the safety who was paralyzed in a game last season and nearly lost his life on the field, is now giving all the speeches before home games. He sits in his wheelchair on the sideline and smiles and nods as players walk past. They come off after big plays and touch his hand. Whether it’s Walker, Johnson, or Marley, the collection of names is working. The Green Wave will almost certainly be playing at Christmastime for only the fourth time since 1980. Only a year removed from a two-win season, the name Tulane no longer means losing.